Classroom science projects can be completed by individuals or groups and include the scientific method. Power your classroom with renewable energy! As you deck the halls with holly, lights and ornaments think about ways to keep your kids busy this holiday season. One option is to let them work on Power House Experiments for Kids. These projects explore hot science concepts like renewable energy sources and electricity. Sometimes it is a good idea to return to the basics of science activities. Classic Picoturbine windmills, for example, offer activities that will enhance any program for renewable energy education in the classroom. 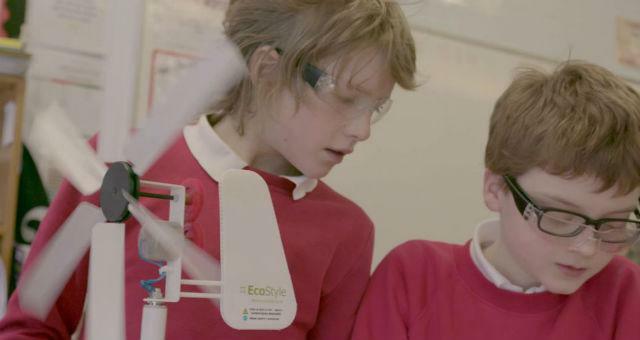 You can use these turbines to experiment with wind energy and renewable energy concepts. One fun activity that you can engage in when exploring renewable energy education in the classroom is the PicoTurbine STEM Playoff. This activity turns learning about renewable energy into a fun game. Selecting quality science kits is important when you are building your science curriculum. Wind and solar experiment kits, in particular, need to come from quality manufacturers. This is because these kits contain electrical devices that can be problematic if they are not constructed properly. Renewable energy education in the classroom needs to focus on the basics. One concept that teachers need to teach their students is how to measure voltage. This project will not only demonstrate what voltage is but also how to measure it accurately. One angle that you can take when developing a lesson plan for your science class is to focus on the design of a wind turbine. Renewable energy education in the classroom will walk you through a project that explore how the pitch of the turbine’s blades impacts it energy producing capabilities.